If you have invested in solar panels, consistent and effective cleaning of these panels is vital in order to keep them working their best. Automated solar panel cleaning systems have proven to be a popular choice with residential and commercial customers alike, and with good reason. Here are a few reasons why cleaning your solar panels the automated way may work for you as well. Easy installation and programming. Automated systems are very easy to have installed. Once installed, you can program them to clean as little or as often as you would like. Increased efficiency means cost savings. Automated systems generally do a better job of cleaning hard to reach solar panels, leading to cost savings from reduced power consumption. Eliminate the risks associated with manual cleaning. These include damaging roof panels or, even worse, sustaining an injury. Time your washes for more efficient cleaning. Cleaning when the sun is down reduces risk of damage from residual build-up of detergent concentrates. Unlike manual cleaning, automated cleaning can be done after sundown. Save time. Reclaim the time you would normally expend cleaning your solar panels. Save maintenance costs while decreasing liability. 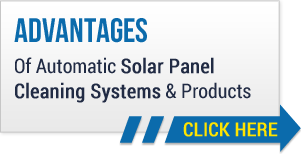 Eliminate the costs associated with having someone clean your panels. Eliminate the risk of liability should your solar panel cleaner be injured on the job. Solar panels actually pay for themselves over time. The money you save on electric bills makes solar panels an incredibly cost efficient investment. As you can see, there are many reasons why choosing an automated solar panel cleaning system makes sense. From cost efficiency to safety and everything in between, automation is the most effective way of making sure your solar panels are giving you all they can.